The present volume is a collection of essays attempting to investigate the parameters which relate to the celebration of the Olympic Games by Athens in the past - specifically in 1896 and 1906. 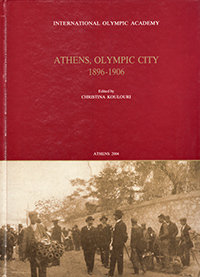 The main hypotheses have to do with how Athens hosted the Olympic Games of 1896 and 1906, how it functioned as an Olympic city, how it was seen by foreign visitors and athletes and what were their experiences, what were the consequences of these Olympic events for Greek domestic and foreign policy and for the image of the city itself, and what was the relation between the expectations of local people and foreigners and the reality, between the ideal and the real Athens. Τhese questions presuppose interdisciplinary approaches which take into account demographic, social, economic, political and cultural parameters of the two Olympic events in Athens. Thus the history written in the chapters of this volume is not an "inside" and "introspective" history of the Games which contents itself with a record of the names of the athletes, athletic achievements, the nature of the events, and, in general, all those features which go to make up what is called the athletic side of the Olympic Games. The emphasis is put on the people (who traveled to Athens, who lived there, who attended or took part in the Games), on the place - real and invented - of the revival of the Games and on the festival (of athletics, but not only) itself. All essays are based on original research conducted in the archives and the libraries of different countries and mainly in the Archives of the Hellenic Olympic Committee in Athens.